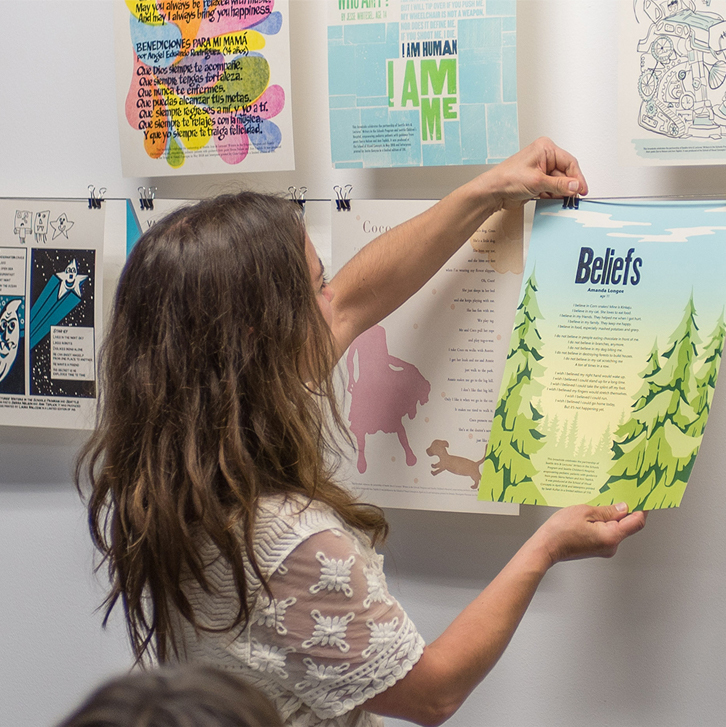 Sarah Kulfan is a visual designer, illustrator and letterpress printer. She is the proprietrix of Gallo Pinto Press and Beans n’ Rice where she respectively prints limited edition prints and runs her freelance graphic design business. Sarah thrives working as an independent artist and designer where the flexibility in her schedule allows her plenty of time for opting outside. When she’s not hiking a trail or climbing a peak, she can be found in her letterpress studio, working on her latest reduction cut, a printing method which has occupied much of her time lately. At an early stage of her freelance career, when there wasn’t much work to keep her occupied, she apprenticed with Stern & Faye, Letterpress Printers, where she learned the fine details of letterpress printing. Letterpress for her is all about bridging her creative and active pursuits. It allows her to story-tell her observations outside. The interplay of shadow and light, the relative smallness of the human scale, the high-drama of sweeping landscapes, and the variety and richness of colors are just a few real life experiences she encounters when she’s outside, and these are all concepts that she is trying to bring to the page. Working with reduction cuts is an interesting challenge as a print run truly is finite. There is no possibility of creating a second edition as the plate is carved away with each pass. Each new cut that’s made after successive print runs becomes a bit of a leap of faith. It’s a nerve-wracking and immensely satisfying approach to putting down layers of ink. My process usually starts with on-site sketches and photography. I’ll refer to these photos and initial sketches while redrawing the illustration many times over to tease out details. I dial things in further by using Photoshop to help map out layers of color. Recent projects have typically ranged from six to thirteen passes. In addition to reduction cuts, split fountains, metal type and pressure printing techniques are also often looped in to the process. The row of roosters in the Gallo Pinto Press logo was printed from a piece of linotype that originated from Stern & Faye Letterpress where I learned to print. Owned and operated by Chris Stern and Jules Remedios Faye, “the printing farm” included a converted barn with an extensive letterpress shop and metal type foundry taking up the first floor and a bindery upstairs. Nestled on the bank of the N Fork of the Skagit, the south facing windows looked out over an apple orchard. On the drive up, you could see Sauk Mt from highway 20. Much of the equipment in my shop comes from Stern & Faye and certainly all my printing know-how can be attributed to my time at the printing farm.